A lively, 11 lb. Rat Terrier Mix. Rascal was living in the woods. Nobody was looking for him. NNHS received a call about Rascal and agreed to take him. Rascal was under weight, Heartworm positive, and was in need of medical care. Rascal is now a healthy, happy little guy. He is up-to-date on shots. He’s finished his Heartworm treatment and is waiting for that special person to give him a home of his own. Rascal’s lucky to be alive, yet another victim of an uncaring owner who left an 11 lb. dog in the woods to fend for himself. Rascal loves attention. He’s very friendly and enjoys going for walks, is crate-trained, and gets along with other dogs. 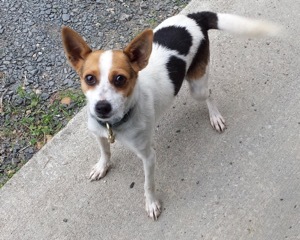 For more information about Rascal, contact NNHS at 804-472-2727.